By about 600 B.C. a part of the Ganga plain had been cleared of forests and people had settled down in different tracts for example Panchala, Surasena, Kosala, Kashi, Videha, Magadha and so on. These territories were called Janapadas and named after the rulling-clan in each area. Buddhist literature and Jain literature shows that around 600 B.C. whole of northern India was divided into 16 kingdoms known as Mahajanpadas. Each of these had its own capital. Out of the 16 Mahajanapadas four were very powerful. These were Magadha, Koshala, Vatsa in the Ganga valley and Avanti with its centre at Ujjayani. They no longer lived as simple tribes in group of villages. They formed themselves into kingdoms and republics. It was the more powerful kingdoms and republics that were referred as the Mahajanapadas. The kingdoms and republics began to make new laws and their systems of government also changed. A republic is that form of government in which power is held by the heads of families and clans or a group of selected persons or a selected chief. There is no hereditary king. In ancient republics or Ganasanghas it was Kshatriya families who owned the land and who also had political power and were represented in the tribal assembly. This type of government is called Oligarchy i.e. the rule of the choosen few, as the non – Kshatriyas were not represented in the assembly, for example Vrijis of Mithila, Sakyas of Kapilavastu, lichchhvis and Mallas of Pava. The kingdoms represented by the ruling clans were constantly at war because they either wished to extend their territory or to control the rivers. Slowly Magadha emerged as the most powerful by defeating all other kings. The great religious teachers, Mahavira and Gautama Buddha both preached in Magadha and they have mentioned the kings of Magadha and the life of people in their teachings. He married princess from the adjacent ruling families. The kingdom of Magadha had large deposits of iron ore (Chhota Nagpur region). By exploiting those he added to the power and wealth of Magadha. He also conquered the kingdom of Anga which was to the south-east of Magadha. with this victory he can access the important river-port of Champa that situated in the kingdom of Anga. Ships sailed down to the delta of the Ganga and further along the east coast of India to south India from this river-port of Champa. From south India the ships returned with spices and precious stones that made Magadha rich. Bimbisara allowed the headman of the villages to speak to him directly because he wished to know what people wanted. He sent ambassadors to places even as far away as the kingdom of Gandhara in the north-west India. 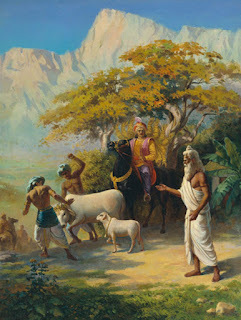 But unforttunately, Bimbisara was murdered and succeeded by his son Ajatashatru. He pursued a policy of expansion. He conquered Koshala, Kashi, Vrijjis and Vaishali. After the death of Ajatashatru two important dynasties, namely the Sishunagas and the Nandas, ruled Magadha. The Nandas were ultimately succeeded by the Mauryas. In the age of janapadas & Mahajanpadas, the priests or Brahmans said that the king was not like an ordinary man but as he was like a god and what is more, that it was the Brahmans who by performing certain ceremonies endowed the king with god-like powers and virtues. Thus, the king became very powerful and at the same time the influence of the Brahmans was also great, because they were his advisors and without them the king could not rule or perform the sacrifices. The king now came to symbolise the state. The state included a form of government in which it was argued that the king, because he protected the society, required an army to do so and because he maintained law and order required officers to help him do so. In order to perform these duties the king was given the right to collect taxes. The taxes also helped to meet the cost of the army and of the officers as well as king. This kind of society was very different from the clans and tribes of the Vedic Age. known as Amatya (minister), Purohit (priest), Sangrahitri (treasurer), and Senapati (chief of army). The head of village (gramini) also helped him in the administration. The peasants gave 1/6th of their produce to the king. The metal workers made implements free for the king, and the weavers gave a certain amount of cloth free to the king. In the beginning taxes were collected in kind and they were distributed as salary to the officers. Later the king appointed a group of officers as tax collectors. It was the job of some of these officers to go to every village, measure the fields of each peasant and to make a record of the amount of grain which the peasant produced. When the harvest was ready, the tax collector came to the peasant and collected the amount due to the king. Now there were more villages as the population was increasing. In the earlier period, there had been a few small towns. But now many more towns and cities came into existence. Towns were came to known as Pura and Nagara and the large towns as Mahanagar. Some of the important towns mentioned in the literary sources were Ujjayini (Malwa), Tamralipti (Ganga delta), Shravasti, Ayodhya, Kashi and Kausambi (U.P. ), Champa, Rajgir and Vaishali (Bihar), Pratisthana (Maharashtra), and Bhrigukaccha (Broach in Gujarat). Towns often grew around craft centres, trading centres and the capital of kingdoms. The craft centres were originally villages which had specialised in certain crafts. When craftsmen or artisans living in an adjacent area collected together, the settlement slowly grew into a town. money and in kind such as grains. Many new trade routes emerged in this age which connected different parts of India as merchants helped craftsmen in buying and selling of raw materials and finished goods. If we talk about foreign lands, by the 6th century B.C., India had direct and continuous contacts with the west through Persia, Greece and Rome, So long distance trade also flourished. In this period, another thing, i.e. regular use of money or coins was seen. Coins were usually crude pieces of silver and copper. These early coins are known as punch-marked coins. So trade became easier. The artisans and merchants organised themselves into groups known as shrenis or guilds. Their heads came to be known as shresthis. Because the artisans lived and worked together, they became so close that they were regarded as a caste (jati). The sons followed the same profession as the fathers so that the caste became hereditary. Gradually separate laws were made for each of these castes and laws were recorded by the Brahmans. Many of them were very strict laws. People of one caste could not eat with the other caste, nor could they marry outside their caste. In theory there were four Varnas – Brahman, Kshatriya, Vaishya, and Shudra. Outside these four, there was a fifth group of untouchables who were treated with contempt and looked down upon. Now Jati came to be known by birth. Laws regulating varna and jati system became rigid and discriminatory. The family remained the basic unit of society. Stories about the heroes of earlier times were composed as long poems and became popular. Some of the stories were put together into one even longer poem and such poems are what we call ‘epics’ such as the Ramayana and the Mahabharata. Rituals and sacrifices of Vedic age slowly drifted to intellectual salvation and it continued in this period also which gave rise to Buddhism and Jainism both of which laid great emphasis on right conduct and non-violence (Ahimsa).